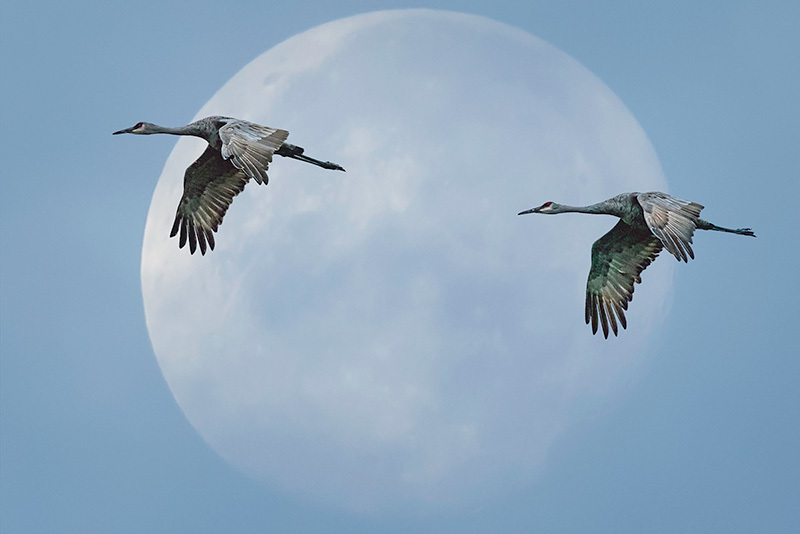 This photograph is a composite, both moon and Sandhill Cranes were taken from the same spot and only moments apart. I enlarged the moon for effect. The photograph was taken this past fall at the Jasper-Pulaski Wildlife area during the Sandhill Crane migration. I used a Nikon D750 with a 300mm Nikon prime lens with a 1.4 teleconverter for both shots: Cranes 1/4000; F/5.6, ISO 6400. Moon: 1/320; f/8; ISO 640. Composited in Photoshop. I used a Gimbel-style tripod head (Promaster) which is very useful for tracking birds in flight. It allows for extremely smooth tracking and as well as avoiding camera shake when leaning on the rapid-fire shutter.